Scientists have discovered a new type of alien planet — a steamy waterworld that is larger than Earth but smaller than Uranus. The standard-bearer for this new class of exoplanet is called GJ 1214b, which astronomers first discovered in December 2009. New observations by NASA's Hubble Space Telescope suggest that GJ 1214b is a watery world enshrouded by a thick, steamy atmosphere. 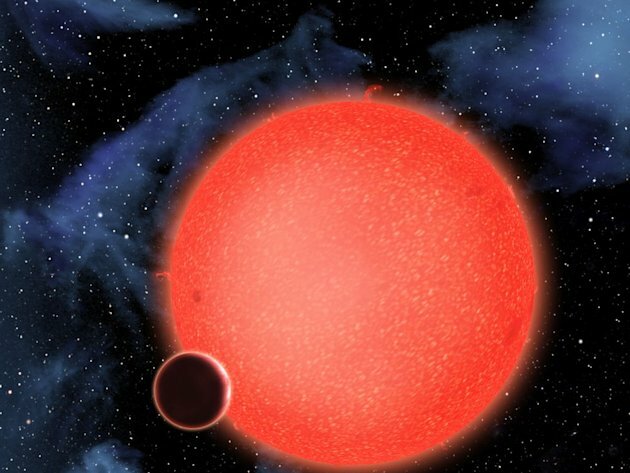 "GJ 1214b is like no planet we know of," study lead author Zachory Berta of the Harvard-Smithsonian Center for Astrophysics in Cambridge, Mass., said in a statement. "A huge fraction of its mass is made up of water." To date, astronomers have discovered more than 700 planets beyond our solar system, with about 2,300 more "candidates" awaiting confirmation by follow-up observations. But GJ 1214b, which is located 40 light-years from Earth in the constellation Ophiuchus (The Serpent Bearer), is something new altogether, researchers said. This so-called "super-Earth" is about 2.7 times Earth’s diameter and weighs nearly seven times as much as our home planet. It orbits a red-dwarf star at a distance of 1.2 million miles (2 million kilometres), giving it an estimated surface temperature of 446 degrees Fahrenheit (230 degrees Celsius) — too hot to host life as we know it. Scientists first reported in 2010 that GJ 1214b's atmosphere is likely composed primarily of water, but their findings were not definitive. Berta and his team used Hubble's Wide Field Camera 3 to help dispel the doubts. Hubble watched as GJ 1214b crossed in front of its host star, and the scientists were able to determine the composition of the planet's atmosphere based on how it filtered the starlight. "We’re using Hubble to measure the infrared color of sunset on this world," Berta said. "The Hubble measurements really tip the balance in favor of a steamy atmosphere." Berta and his colleagues report their results online in the Astrophysical Journal. Since astronomers know GJ 1241b's mass and size, they're able to calculate its density, which turns out to be just 2 grams per cubic centimeter (g/cc). Earth's density is 5.5 g/cc, while that of water is 1 g/cc. GJ 1214b thus appears to have much more water than Earth does, and much less rock. The alien planet's interior structure is likely quite different from that of our world. "The high temperatures and high pressures would form exotic materials like 'hot ice' or 'superfluid water,' substances that are completely alien to our everyday experience," Berta said. GJ 1214b probably formed farther out from its star, where water ice was plentiful, and then migrated in to its current location long ago. In the process, it would have experienced more Earth-like temperatures, but how long this benign phase lasted is unknown, researchers said. Because GJ 1214b is so close to Earth, it's a prime candidate for study by future instruments. NASA's James Webb Space Telescope, which is slated to launch in 2018, may be able to get an even better look at the planet's atmosphere, researchers said. Nice to see this was published in mainstream news. Even though no one will consider there's more than steam in a place like that.